If You Have These 11 Signs, You Might Have Fibromyalgia. Acupuncture Can Help in More Ways than One. 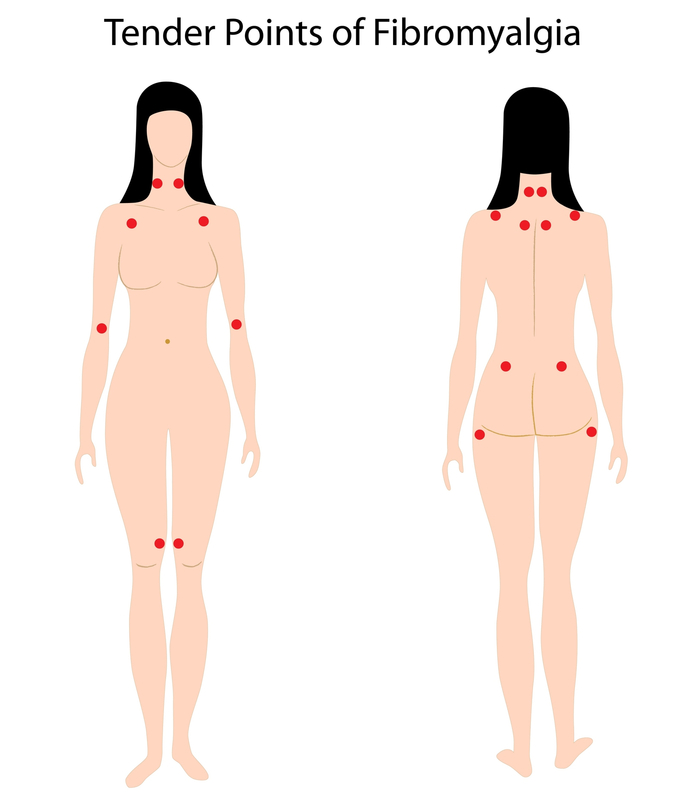 In this illustration you can see 18 painful areas. If you have chronic pain, and if at least 11 of these 18 points are painful with mild pressure, then you might have fibromyalgia, according to the American College of Rheumatology. Acupuncture, I am happy to say, can help, and in more ways than one. But first some facts about fibromyalgia you might not know, to show you how many people’s lives it seriously impacts. One in 50 people have it. Of this number, 80%-90% are women. And unfortunately, 30%-40% have to stop working, the pain and malaise are so bad. Pain is the main symptom, but there is a long list of other problems that accompany fibromyalgia, such as fatigue, insomnia and depression. The cause of fibromyalgia remains unknown. Can acupuncture help? Yes, and experience has taught me that a two-fold treatment is necessary. First, a person’s overall health must be improved. Experts agree that fibromyalgia is a systemic disorder, so the whole person must be treated, not just the pain. Acupuncture is “holistic,” meaning it treats the “whole” person, mind and body. I first endeavor to determine the person’s basic energetic imbalance. I then choose a strategic combination of acupuncture points which have multiple beneficial effects, including enhanced immune function, less depression, more energy, improved sleep, and improved ability to handle stress. Stress often exacerbates fibromyalgia. Second, I treat the pain directly. Gentle needle insertions into painful areas can release trigger points and restore normal muscle function. Trigger point therapy is one of my areas of special interest. The usual result is a gradual reduction of pain over the course of a series of treatments. I have several testimonials on this website from fibromyalgia patients. Below are some excerpts. I invite you to read the complete testimonials from these and other patients I have treated. “I see acupuncture as an essential piece in fibromyalgia management…” Deborah Ruggles, MSN, CFNP.